When our blogging collective Ahead of the Curve decided on the subject of Plus Size Thrifting I was concerned because I had just written a post a few weeks ago about thrifting, and here was the subject coming up again. But, since my husband and I just retired a couple of years ago, and I still want to be able to spend money on clothes, I set out to find a bargain I liked enough to blog about. After the dress, I wanted something to dress it up, so I found this Alberto Makali pleated Shirt on ebay. But then I wanted to find something I already had in my jewelry box. 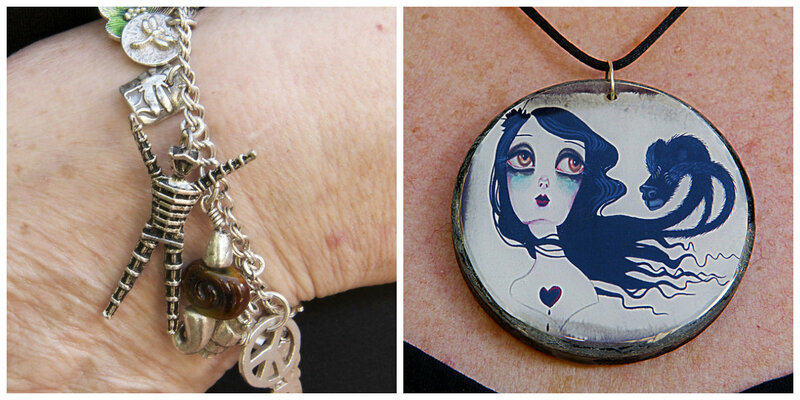 So it seemed like a “Do It Yourself” bracelet, and a gifted pendant that I had never worn would be great choices. And even the elastic belt was a gift that arrived in the package with the dress, although I had not purchased it. I had a lot of fun with this challenge. Click HERE for some thrifting tips from the Curvy Fashionista. When I was researching thrifting I came across this lovely quote. Don’t stop now! Click HERE to check out all the chic, smart ways other bloggers from AHEAD OF THE CURVE interpreted this month’s theme, Plus Size Thrifting. Let thrifting be the guilty pleasure you don’t really have to feel guilty about. This entry was posted in Ahead of the Curve, ASOS Curve, Plus Size Thrifting by affatshionista. Bookmark the permalink. I really like the shirt & dress combo! Thanks, kind of like my old corporate look but more fun. It is even cuter up close. It is pleated and has tiny little beads here and there. Thanks for commenting Valerie. Love the jewelry and the black and white jacket great! Found you via Arielle’s blog. Happy Thursday…xo! Thanks Whitney, I will check out your blog too! You look amazing! Super polished. I really love the black and white, paired with your purple glasses! SO MANY BEAUTIFUL DRESSES FOR US!